When you attend a festival in Atlanta, Orlando New York, or Washington DC, you’ll probably be on your buses for miles and hours each day in the destination. At Panama City Beach, Florida, we have the auditorium, every attraction, and every restaurant, no more than five miles apart. You can count on not having over twenty local miles when you come to the Panama City Beach Music Festival, and that saves you money. After traveling for hours to get here, it’s really nice to not have to spend more time on the bus. You get where you need to go in a hurry, and then get out there and have fun. Don’t get us wrong, traveling by motor coach is a very comfortable way to travel, but closer destinations that make up the elements of your package, give you more time food, fun, and the beach. 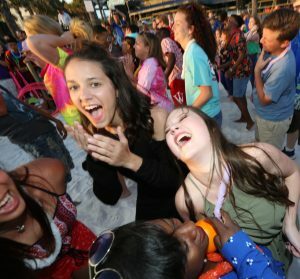 As of the date of this writing, (August, 24, 2018) we have seven performance slots yet to fill for the 2019 Panama City Beach Music Festivals, so register today, get signed up, and get those kids to the beach!